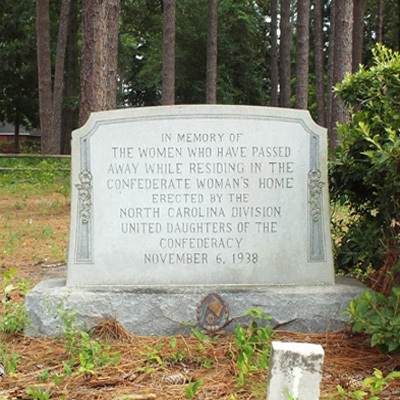 The Confederate Woman’s Home and Cemetery memorial is a large tombstone with incised inscription. It faces small headstones that mark the burial spaces of former residents of the home. Near the marker is a modern plaque that plots out the headstones and lists the names of the 65 former residents buried there. The home was demolished in 1982 but two brick columns connected with an ironwork arch spelling out CONFEDERATE WOMAN’S HOME still stands. Attached to each of the columns are eight stone memorial plaques. An old photograph of this arch does not show any of the stone plaques. Instead, there are what appear to be two bronze plaques attached to the left column. This arch does not appear in a photo of the building dedication in 1915. Left Entry Column front four plaques: IN MEMORIAM / FATHER AND MOTHER / BENJAMIN CHURCHILL GORHAM / AND HIS WIFE / LAURA MCDANIEL / MRS. HUNTER SMITH / FOUNDER OF HOME GIVEN BY / RUTH HANES CRAIG / IN MEMORY OF HER DEVOTED MOTHER / LIZORA FORTUNE HANES / WIFE OF / P.H. HANES / CO. C 16TH. NORTH CAROLINA / BATTALION. Mrs. John H. Anderson president of the North Carolina Division United Daughters of the Confederacy presided over the dedication. Anderson presented the memorial to the Fayetteville committee chair Mrs. E.R. MacKethan who in turn presented it to Charles G. Rose, chairman of the home’s board of directors. Rose then gave an address on the home’s history before it was unveiled by Miss Marquerite Grady and Thomas Watson, Jr. The home opened 1915 with support from the state legislature for the benefit of widows and daughters of North Carolina’s Confederate veterans. By 1981 only seven women lived in the home and it was not practical to keep it in operation. In 1982 the two-story brick building was razed and the land used as a parking lot for Terry Sanford High School. Sixty-five women are buried in a cemetery that remains. 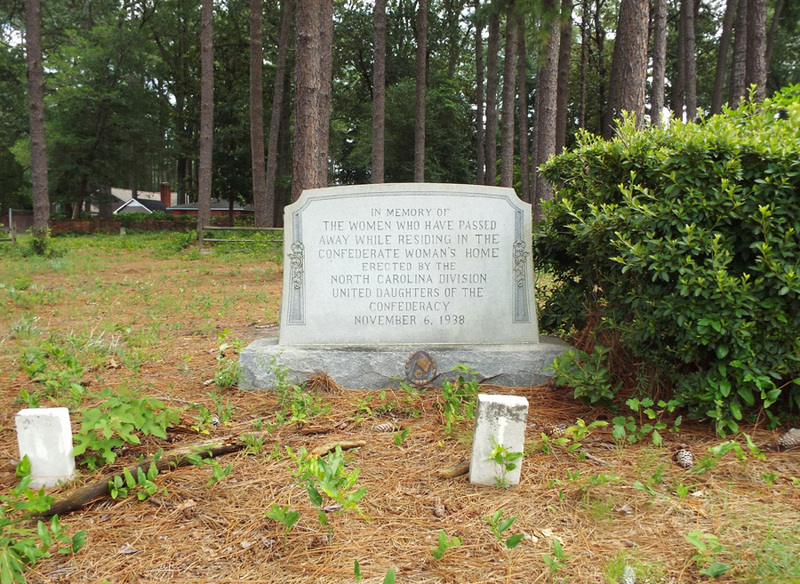 The memorial can be found behind Terry Sanford High School located at 2301 Ft. Bragg Road in Fayetteville, NC. To the left of the school building there is a parking lot in front of the tennis courts. From the parking lot to the left of the tennis courts is an unpaved road with a locked gate that leads behind a ball field. Behind the baseball field there are two graveyards. The one surrounded by a brick wall is for the Gee family. The Confederate Women’s cemetery is marked by a brick and iron archway. The area is partially wooded and somewhat overgrown. It is bordered on two sides by walls and fences that separate it from single family houses. One side is bordered by the football field end zone and one by the baseball field backstop and dugouts.